It would be a "miracle" if Newcastle were to avoid relegation from the Premier League, says Rafael Benitez. The Magpies failed to win any of their opening 10 games of this campaign, but are currently 15th in the table, five points above the relegation zone. They impressed on their return to the top-flight from the Championship last season, finishing in 10th place. "We have to be realistic and understand we will be in the bottom half for the season," said Magpies boss Benitez. "For me, it is almost clear and if we can be better than three teams, it will be another miracle. "It was a miracle last year. People were thinking, 'Oh, you finished 10th...', but with a couple fewer wins, we could have been in the bottom five, so it was a miracle. "If we do the same this year with teams spending even more money than last year, it will be a miracle." 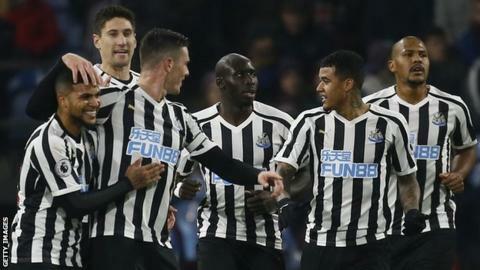 At the beginning of December, Newcastle owner Mike Ashley said he was "hopeful" of selling the club "before the January transfer window". As well as Tottenham and Watford, Newcastle were only one of three Premier League clubs to receive more transfer fees than they spent in the summer window. Benitez added: "I know what is coming now and I know where we are. You can see the team - the team is trying a lot of things, but still it's not enough sometimes to get the points, and it will be like that. "I'm trying to tell everyone, realise where we are, realise what we have to do and if we do well, fine, we can finish 10th or whatever. "But if we think we have to beat these teams which have spent £100m, every one of them, during the summer, if we think we can beat them easily every game, no chance. We are wrong, 100%." Benitez comes up against his former side and unbeaten Premier League leaders Liverpool on Wednesday, 26 December (kick-off 15:00 GMT).